The following are books that I highly recommend for those that want to explore the history and use of the I Ching. This list includes volumes I have utilized in my journey of exploration over the last 35 years. Consulting the I Ching with Bronze Chinese Coins is the way I started many years back. All of the following books and materials are for sale. When you click on the book of interest you will be automatically transported to Apple Itunes store and or Amazon for additional information and an easy, safe and secure checkout process. The I Ching, or Book of Changes, a common source for both Confucianist and Taoist philosophy, is one of the first efforts of the human mind to place itself within the universe. It has exerted a living influence in China for 3,000 years, and interest in it has been rapidly spreading in the West. James Legge’s translation of the I Ching is the standard against which all later editions of this timeless oracle have been judged. Part divination system, part guide to living a superior life, the I Ching can help you divine your way in this complicated world. Join the millions of people who have already experienced this mystic way. The most common method for casting the I Ching involves tossing three coins six times to create the six-line pattern or hexagram. A traditional technique for deriving a hexagram, dating from about 500 B.C., involves a fairly complicated process of selecting and sorting fifty sticks, usually yarrow stalks. The best yarrow stalks for this were the ones that grew on Confucius’ grave, but the supply was limited! After the coins or stalks are tossed and sorted out, one looks up the interpretation in the sacred book. A more modern method of I Ching uses a series of coin tosses using three identical coins (copper pennies will work). In each case, the process is done six times, with each outcome producing one line of the hexagram. Like a building, the hexagram is assembled from the ground up, the bottom line is considered the first line. 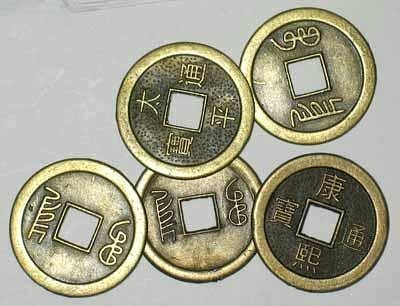 The easiest hands-on method for casting the I Ching is to use three coins. If you are using Chinese bronze coins with the square hole in the middle, where there are no obvious heads or tails, simply choose for yourself which is which before beginning, and stick with your decision. 1. Remember to stay focused on your dilemma or subject or question when casting. 2. Hold the coins loosely in your hands, shake them briefly, and then toss them, all the while contemplating your query. The line you record is determined by assigning numerical values to heads and tails, then adding the total. Each head is a 3, and each tail is a 2. 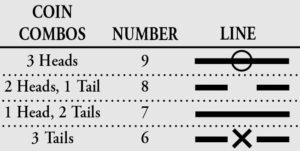 So, if you cast one head and two tails (3+2+2), your starting line would be a 7 (see the chart below). 3. Collect the coins and toss another five times, recording the numerical values and the corresponding line each time, building your six-line hexagram from the bottom up. The hexagram you’ve just created can be called your “present hexagram.” In order to produce a “future hexagram,” just change all the lines marked with an ‘x’ or an ‘o’ into their opposite. Any broken lines (Yin) marked with an ‘x’ flip into their opposite—a solid line (Yang)—and solid Yang lines marked with an ‘o’ turn into the broken Yin lines. The I Ching means “Book of Changes” in Chinese and is all about Change, which is always happening, which is the one constant in life. If you get no changing lines when you cast a hexagram (i.e. no 6 or a 9 value), that signifies that conditions related to your topic are relatively stable or not in great flux at this particular time. Once you have identified your present—and, possibly, future—hexagrams, use this Hexagram Identification Chart to locate the hexagram numbers and click through to read the interpretation, considering only the changing lines you may have gotten. Kat Ohren, community coordinator of the Crystal Divination Community. The I Ching explained: This is a great introduction to the history of the Hexagrams and a guided methodology for consultation.